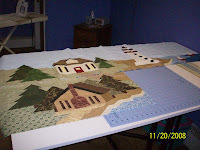 Block # 4 is completed. Only 8 blocks to go :) The last row, (the last two sections of that row to be exact) of this block gave me lots of trouble. I don't know if I cut wrong, sewed wrong or what. But as my friend ,Barb, says, "just make it work" and that I did. The next block is mostly water and a lot of angles. Oh dear! I like seeing these blocks come together on our design boards, but seeing them preserved digitally online makes them so ...what's the word...official! Peggy, you may notice where we are taking liberties (to put it mildly) with the use of our stash fabrics. 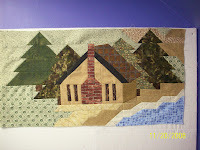 Those fabrics we thought we'd never use just seem to work with a "scenic" block.